Introducing Nick Johnson of Autoprive, a company dedicated to personal service and sourcing high end luxury cars. In essence Nick will do the sourcing and advising and I can look after the import and matriculation. Alternatively if you are not a resident or have no interest in Andorra Nick is still available to help you. "Having sourced premium cars for over fifteen years, Nick has built up an enviable black-book of worldwide contacts to enable him to source the exact car you require no matter where that vehicle may be. If you are in need of inspiration or require investment guidance, his buying experience and market knowledge will prove invaluable. Nick will also take charge of any ownership request so that you can enjoy your vehicle(s) and come sale time he will maximise the value returned to you free of hassle." If you contact Nick directly please address the email to him and let him know that I referred you so we can work toether on the documents for you. "Over 65" new residents beware of the new driving license age limit. In spite of the traffic law here stating that you cannot apply for a test for the Andorran driving license over the age of 65, they have never applied that to passive residents since they accepted that a new resident say of 67, who could not simply exchange his driving license and had to take the local test, was not a newcomer to the road per se. Well that was until now: If your driving license is on the list of countries below that simply allows you to exchange licenses then you have no problem as long as your driving license was valid at the time when you applied for residency ( and still is). In other words do not apply for residency and then later renew your license in the home country as they will not accept it. If your license is not on the list of countries AND you are over 65 the only way forward is that you must secure the appropriate certificates of authentication duly legalised where necessary in order to get around the 65 year rule. Before this you could just take a couple of lessons and a quick practical and it saved all of the paperchase, it was an easier option and still remains so for those under 65. If you are going to be a resident and you may fall foul of this please let me know so we can secure the correct documents before you leave your country, they are very fussy !! How do I obtain an Andorran driving license ? How do I import a car ? Since 2008 the Government no longer issues notifications for the ITV testing. Please note that the first due date is on the right hand side of the yellow card. In general the ITV test is due after the first 5 years, then after 2 years, 2years and then every subsequent year. Any small defect must be renewed by the next test and major defects you have 14 days to rectify and re-present for inspection. You can now book an appointment for the following month here. but it is in Catalan. The ITV inspections appear to have tightened somewhat in their interpretation of the yellow card registered details and those that they find on the vehicle itself. Be warned that any modification, be it colour, tow bars, suspension, engine mofiifications and the like must be registered with Government and if necessary the yellow card must be amended before the ITv. Since 2014 there is now NO age limit at all ( originally it was 5 years for a new resident and 3 years in all other cases); The only criteria is that the car posesses a certificate for EURO 5 emissions. EURO 5 is an EU wide scheme to limit emissions it started at EURO 1 over the years and Andorra has pitched it's acceptability at EURO 5 which came into effect in the EU in 2009 so in effect the 5 year rule is still there, although manufacturers can upgrade the car and get a EURO 5 certificate at some expense though. I do have a friendly English speaking driving instructor and you can now access and practise the theory exam online from the comfort of your own living room, so the procedure of "starting from scratch" is not that demanding at all. A driving test in Andorra is a multiple choice theory exam followed by a practical test normally held on Wednesday mornings. As a new resident here there is always a concern about exchanging licenses and maybe having to sit an exam after so many years of driving! Passive and active residents can own an Andorran registered vehicle, but to drive it legally you will require an Andorran driving license. Unfortunately for new residents from many countries the procedure can be more complicated. 2) A medical certificate from a local doctor, this is easy to obtain. 3) A recent colour passport sized photo, and they no longer accept a machine generated photo, it must be professionally taken. 4) Original and photocopy of both sides of the foreign driving license. 5) If the text for the driving license is not in English, Spanish, French or Portuguese, you may need an official translation (If done in the country of origin, then this will need to be apostillised/Legalised) - However for the countries listed below they do not generally insist on a translation. Please also note that Italy is NOT on the list, they will not exchange Italian licenses full stop. Be warned however that the Government will now keep your original driving license, they used to print cancelled on it. It is up to you whether you later pursue a replacement from your original country, certainly for France Spain and Portugal they do send the license back. For these countries do not attempt to claim you have lost it to get a new one! My country of driving license is not on that list? 2) A certificate from the same Department which explains the categories on the driving license, being careful to include the maximum weights permitted under these categories. In a very recent case the foreign license equivalent category A stated the maximum weight as 3,000 KG, the license and certificates although correctly Apostillised and translated were rejected as the weight category did not match the Andorran equivalent of 3,500 KG. This is being rather pedantic but this Department can be difficult if it chooses to be so. Another foreign certificate was rejected because it was issued by another Department, not the actual license issuing Department. If in doubt please speak to me first before you spend a lot of time and money in an attempt to secure the dreaded documents. For these documents they sometimes insist on a Catalan translation so they will need to go through the official translation process here. Now if the certificate(s) are issued by the same department as which issued the license I am now told that they no longer are required to be Apostillised / Legalised, BUT if they are issued by another authority then they must be Apostillised / Legalised. In any case I will check with the Department on specific cases and documents that can be sent ahead to me. You will also then be required to take a very basic practical test with a Government examiner, so even if you can obtain the documents requested from the country of issue you still in effect have to take 50% of the test. So that is why before your move here you should consider whether or not it is even worth to request and obtain those documents from your home country as you are only exempted from the theory part of the exam. There are two other options if all else fails or documents cannot be obtained as requested, the first one is to apply for and take an andorran driving test if under 65. The theory side is now more straightforward , the multiple choice format can be accessed and practised online. The added complication is that they give you two years from the date of your entry to Andorra in which to apply for this test in another language such as in English, failing which after the two years is up you are only allowed to take it in Catalan !! I am more and more persuaded in the light of recent setbacks of trying to secure the correct Apostillised documents, to recommend to take the local tests from scratch. We have a friendly driving school and they can arrange this for you, and what's more you get to keep your original license !! However please refer to the new over 65 rule where this option is no longer available. The second option is to pay the fine, if you are stopped by the police, which is currently € 60 and they do not take into consideration "previous fines", in other words there is at present no escalator for repeat offences. This option is not the best of course as regulations are always changing and you may get caught out. Warning! The requirements have recently changed, do not attempt this alone! In many cases they now require documents that simply are not issued in the country of origin. I do have ways around this, each customs office at each border require different sets of documents. 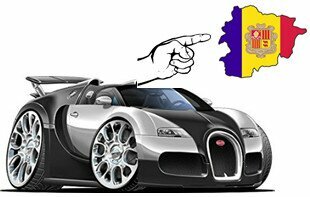 Please be reminded that the import of cars to Andorra is a 2 stage process: You must ensure before you leave with the car that you have the correct export documents from the country of registration. As each country differs please contact your local authorities and request the correct documentation for exporting a car from that country. You need these documents for the Andorran border for the import procedure. As at January 2019 all cars that have been registered in Fance or Spain for import into Andorra must have had their registration cancelled before import. Cars registered in other countries can be imported without their registration cancelled but only at the French side, the Spanish insist on a registration cancellation from all countries. Prior to this the French side imported any cars without cancellation of registration. As a general rule all residents can import a car and pay 4.5% import duty and taxes (For Hybrid cars the import tax can be 1% only). There is also import available for classic cars over 25 years old. In effect if you buy a new car from another country you can arrange for it to be exported and have the tax refunded upon export from the EU (i.e. Andorra). So it is worth pricing vehicles in other countries especially the UK with the devaluation in Sterling, BUT the car must be left hand drive. The exception to left hand drive is for classic cars ( see below) which if right hand drive can be imported BUT ONLY for exhibition and cannot get registered for use on the roads. If you calculate the cost of purchase outside Andorra after refunding the VAT and then add the local import duties, in many cases you can take advantage of residency to purchase a new car at a great discount. For cars imported from outside the EU there are extra requirements, such as complying with European specifications. Again you need to contact the manufacturer of your car and find out what needs to be adjusted on your car before export. Import of cars to the EU from outside is something to attampt in only the rarest of circumstances. Upon import to the EU there is an EU test and the waiting list can be more than several months and cost an extortionate amount of money. There is only ONE testing facility in France !! In the case of new residents they recognise that you are in effect changing your country of domicile and allow a special concession to import a maximum of 2 cars within the first twelve months of your residency but that under the new rules must have a EURO 5 emissions certificate. IF also you can show that you have owned the car(s) for 6 months or more prior to the date of your residency then you will be allowed to import them tax free. You are allowed in your first year as resident here to drive the car (or 2 cars) on the original plates without importing it but you must import it at some time within that year and also remember to exchange your driving license in the same first year of residency. Whether or not your previous country of residence allows you to reclaim some or all of the VAT or car tax paid at time of purchase upon export of the car over six months later, is a matter for you to ask the authorities in the exporting country. In many cases though it is often cheaper to buy a new car for export there once a resident here and pay the 4.5% import duty whilst claiming back the significantly higher rate in the country of purchase. There are manufacturers from whom you can buy tax free for export and there are also dealers with whom you can negotiate for example a refund on proof of export. What you cannot do is simply claim the tax back from Andorra, it has to be done at source. The paperwork is quite complicated, however I have imported many cars and can circumvent most problems that you would encounter if you decide to do this alone, and I can complete the process in a day and a half. There is also the requirement for a local inspection to show that the vehicle complies with local regulations. I am able to get a nod in advance from the person in charge if all the documents are sent ahead of the car. Please contact me if I can be of assistance here.